After the program Pam and I attended at The Scottish Home, light refreshments were served. This means coffee, usually, cookies and scones. While as exciting as that is because the whole program was free, we wanted something of more substance. So, we felt lunch would be a good idea. Pam did her research and discovered a Baker's Square nearby. Oooh pie! As I have complained before, the Wheaton location has been closed for several years now. There is a shop near Fox Valley Mall, but that area is heavily traffic congested so it's not a pleasant drive under even the best of days. This "new" Baker's Square is probably a 40 minute drive for us meaning it would be rare occasions when we could go here. The menu always seems to have changed now. I suppose it's part of a restaurant's duty to remain fresh by adding new items and removing some things that just never caught on. We were lucky in that breakfast, Pam's absolute favorite meal, was still being served. She could get scrambled eggs, bacon, country potatoes and pancakes. I thought about it but there was this new item on the menu that looked really good. This is a butternut squash salad. 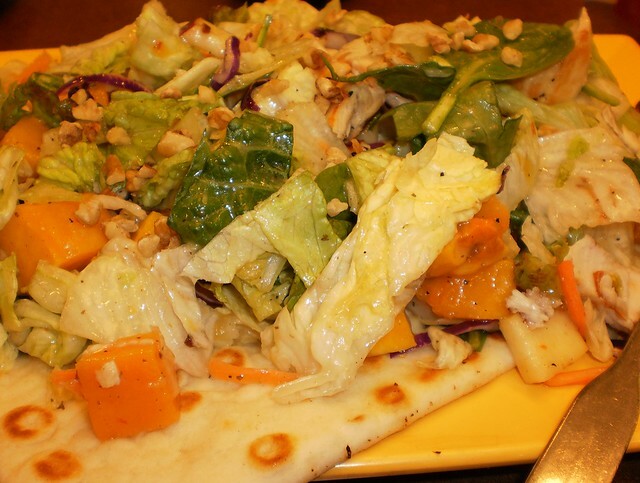 Into a mix of greens was added strips of grilled chicken, chunks of steamed butternut squash, orange pieces and chopped walnuts. The dressing was a very light orange flavored vinaigrette. This was served on a large piece of toasted flatbread. It was delightful. While we were eating, Pam mentioned to the server that we'd come all the way from Wheaton to eat at this Baker's Square, although this was via The Scottish Home. The server looked at us and said, "I thought you looked familiar. I used to work at the Wheaton Baker's Square." Bingo. Both Pam and I thought she looked vaguely familiar. We were such regulars that certain servers would know, when we came, that I wanted hot tea and Pam wanted water. We told the server how much we missed the restaurant. She said it had been a lease issue that caused them to close that store. There is a new Baker's Square in Woodridge now, east of I-355 at 75th Street. While that's still a bit of a drive for us, it does make obtaining pie on those occasions when we desperately need it, much easier. And yes, there was pie. 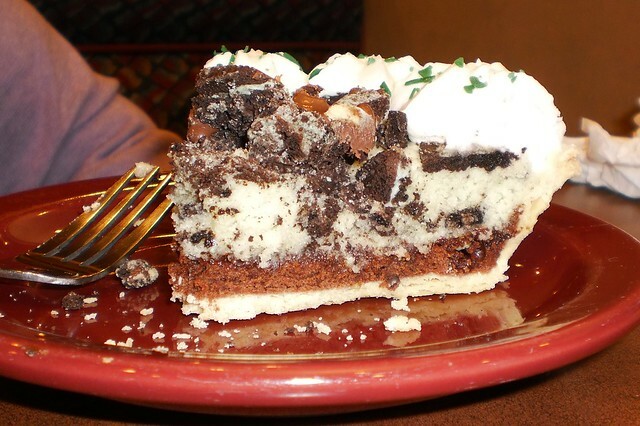 The specialty pie for March is a brownie mint. The bottom layer is brownie which Pam felt should be French silk as the brownie was a bit chewy. Then there is a cream cheese layer topped with chunks of chocolate, chocolate ganache and whipped cream. The cream is dotted with little shamrocks. The mint is found in the brownie and the ganache. It's not overpowering but I don't care for chocolate mint so a whole slice of this would not be appealing to me. I had simple French silk. We were trying to decide on our pie and Pam was debating whether to order the special or something else. I suggested she order a half-slice. I meant to add that if she had concerns about finishing the whole piece, a half-slice would give her pie and not overfill her. She shot me a look that would have curdled concrete. I just burst out laughing. "Okay, well then, yes, by all means, have a full slice." For the record, it's not polite to lick the plate after finishing so we left crumbs. It was snowing rather heavily when we left the restaurant but we didn't care. It was the perfect way to end the adventure.